A group of Nelson women made quite a stir when they staged a protest against the closure of the Nelson Railway line at Kiwi Station in 1955. Organized by former school teacher Ruth Allan Page, the sit-in lasted 10 days and culminated in the arrest of 9 women on September 30, 1955. The construction of the Nelson Railway was fraught with problems right from the start and the line had not turned a profit since 1919. In 1952 the government announced that the line would only stay open until the highways were completed. The line officially closed on June 13, 1954, but the Nelson Progress League managed to secure a one year reprieve for the line on the condition that an increase in freight could be secured. Unable to meet the targets, the line closed again in early September 1955. Hoping for another reprieve, the Progress League organized a protest rally and circulated a petition. Despite attracting a crowd of 4,000 and collecting 12,000 signatures, the demolition of the railway was scheduled for the following week. When Page found out about the scheduled demolition she sprung into action, announcing she would prevent the demolition of the Kiwi Station goods shed. A meeting at the Public Library was held on September 22nd to organize a plan of action. 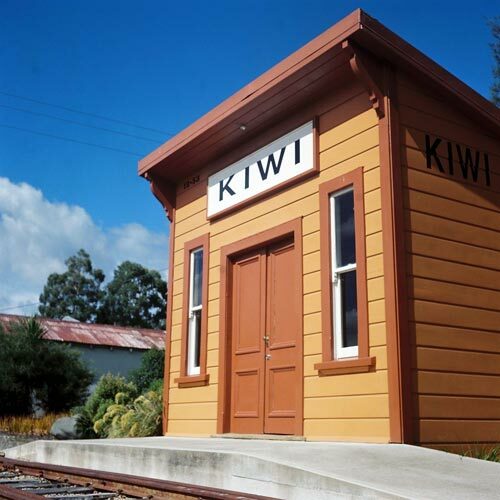 The following morning a demolition gang arrived at Kiwi Station to find five women occupying the goods shed. The day ended in a stalemate, but Page managed to secure a solemn promise from the workers that nothing would happen to the shed over the weekend. Geoffrey Wood, a photographer with The Nelson Mail, was dispatched to cover the protest and the story spread quickly. Page’s parents spent much of the day fielding telephone calls from reporters in New Zealand, Australia and England. By Monday some fifty or sixty people came out to Kiwi Station to watch and show their support. As the protest went on, rumours of sabotaged telephone lines and the drained water vats in Tadmor and Motupiko led Prime Minister Sidney Holland to declare the ‘sit downers’ dangerous and demand they be stopped. Suspicions that the women were possibly Communists prompted a visit from the New Zealand Security Police. The Police were quite surprised to find a group of mostly middle aged housewives sitting on the tracks, quietly chatting, knitting and sewing. Although cleared of any suspicions of sabotage or Communist sympathies, nine women were arrested for obstructing demolition on September 30, 1955: Leader Ruth Page, protest secretary and future MP Sonja Davies, Jean Holz, Jean Robbertson, Jean Bennet, Zena Pearce, Lesley Bartlett, Dot Price, Joyce Robinson, and Phyllis Spedin. The women were fined, but MP Stan Whitehead passed a hat around the courtroom and collected the required fees within five minutes. In just over a year, the tracks that had taken nearly 80 years to build were destroyed. The last two spikes came out on 21 December 1956. Boyes, Mary-Lynn, and Elena Ilalio. Kiwi Heroines: Honouring the Memory and Capturing the Stories of Nelson Women's Save Our Rail Protest at Kiwi, September 1955. Nelson, N.Z. : In Their Tracks Collective, 2005. Davies, Sonja. Bread and Roses: Sonja Davies, Her Story. Auckland, N.Z. : Australia and New Zealand Book, 1984. McAloon, Jim. Nelson: a Regional History. Whatamango Bay, N.Z. : Cape Catley in Association with the Nelson City Council, 1997. O'Donnell, Barry. When Nelson Had a Railway. Wellington, N.Z. : Schematics, 2005. Voller, Lois. Rails to Nowhere: The History of the Nelson Railway. Nelson, NZ: Nikau, 1991. Stade, Karen (2008) The Nelson Railway to Nowhere. The Prow Nelson, Marlborough and Tasman History, Culture and Stories - New Zealand | Nga Korero O Te Tau Ihu.